I am presently researching the fate of the 40 heavy bomber crews of the 8th USAAF who did not return to their bases in England after their mission over Germany on June 21, 1944. My aim is to write a book about these men; my third about the war in the air over Europe 1940-1945. You can check my credentials by visiting the Amazon web site under my name. 2Lt. Lester R. Driggers was the co-pilot aboard a B-17 bomber of the 351st Bomb Group. Their target on that day was Berlin, Germany. The bomber was having engine trouble after bombs away and the pilot headed for neutral Sweden where they safely landed at Bulltofta air field. The whole crew was interned. In 1944, Lester R. Driggers’ parents lived in Evansville, Indiana. Unfortunately, I have no other details. As I would very much like to include Lester’s story in my new book, I seek contact with him or with members of his family who may still be living in Evansville, Indiana. I hope that you can help me in my search. Your kind assistance in this matter will be highly appreciated. I am trying to do some family research on my father's family and have hit a dead end in Indiana. My Great-Great-Great Grandfather was James Cook, born about 23 Mar 1820 in Vanderburg County, Indiana. I have not been able to identify either of his parents or any siblings. Do you have any tips for researching individuals around that time in southern Indiana? Thanks! no later than Monday, December 31, 2018.
at their headquarters in Fowler, Indiana. Rose Vanderwall (L) and Leslie Brost (R) of BCHS check out their new IGS kit, as demonstrated by Ron Darrah. The Society has an historical house museum in Fowler that contains an amazing collection of Benton County history and genealogy. 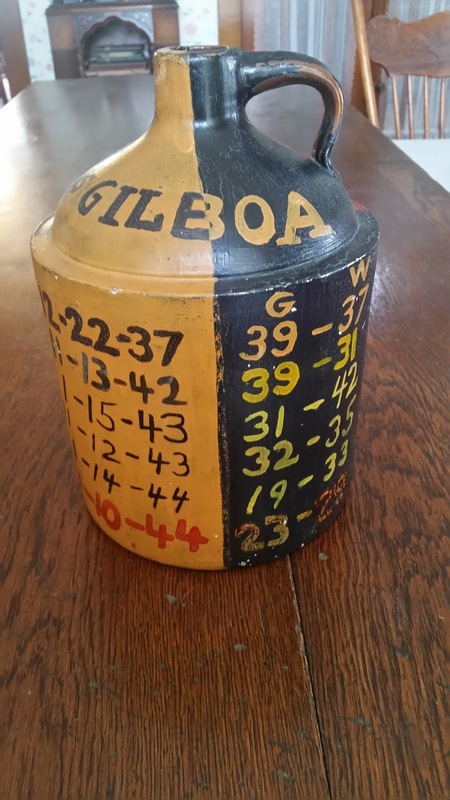 As a unique for-instance, the jug below was a traveling trophy between the schools of Gilboa and Wadena (neither of which are in existence now) for the years 1936-1944. 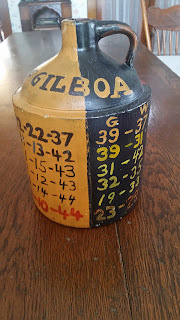 Benton County's version of the "Old Oaken Bucket"
You may contact BCHS at benton.historic@att.net. Coast Guard early 1942 to Dec 1945; married 1948/05/01 to Barbara Martin Vonnegut. Thank you. 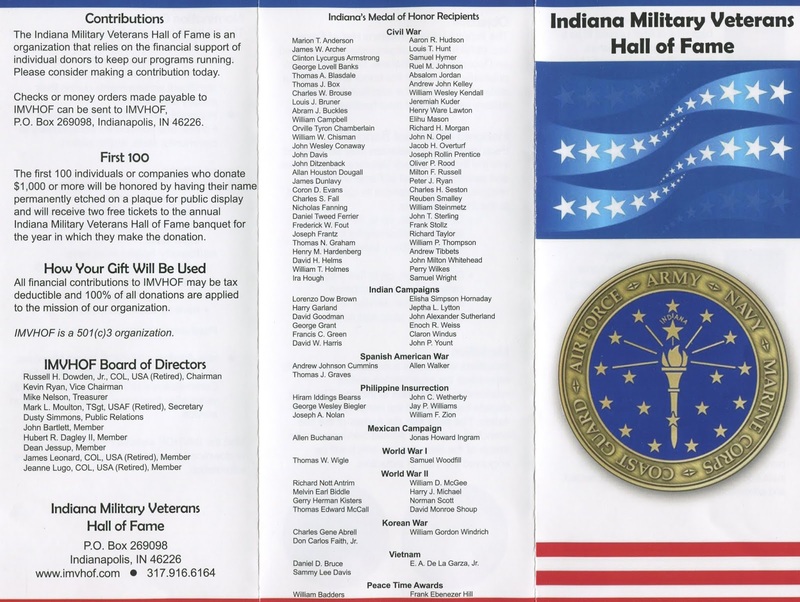 I am the youngest son and our family history keeper and am looking for any references to locations where my dad: John Willard Steenbarger may have lived and/or worked in Indiana from 1920 to 1944. 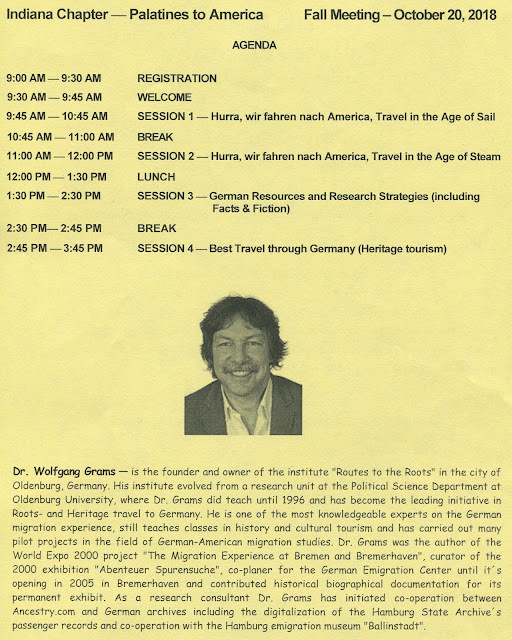 His father was Frank Walter Steinberger/Steenbarger and his grandfather was John Clark Steinberger/Steenbarger. The historical family's last name was Steinberger but there was a transition to the last name of Steenbarger from around the early to later 1800's & early 1900's (Source: US Census records). I have no specific info on why the name change, except that our early family name was Steinberger from Europe in the Tyrolean Mountain area in then Prussia (now called Austria, near what we now know as Innsbruck). One branch of the family emigrated from that region to America to the ports of call in Philadelphia & Baltimore in 1750s in the Northeast. From there, their family members migrated to Virginia (1760) then to Ohio (1804) then some to Indiana (in the 1820's and on). I know my dad's Home town is Shelbyville, Ind. I have collected much info from there on after about 1944. But I have only a little about him just prior to the 1940s and later up to 1944. What I have is that he played "Town Ball" sometimes (town sponsored baseball teams of the 20's - 30's) near Higginsville & Corder, Indiana in the mid-30s, but nothing about where he lived at that time frame or earlier. After that I know he was back near Shelbyville where he joined the Army in 1944. He Had some experience in Blacksmithing, his father's and grandfather's trade then. and I have one address where he had lived in the mid-1930s. It is 151 Grant 6 and a reference to "The Maze house" in/near Geneva, Indiana. I also have a picture of him and my mother outside of the Marshal Co. Courthouse where they may have been married in 1944 but have not tried to find any court records of that event yet either. Besides playing baseball in the mid-30s, I have a reference, written by Dad on the back of a picture of him and a Boxing promoter's last name of "Timmons" from 1936, but I do not know where in Indiana. This would be the time frame that dad, then 26 years old would have last played baseball and returned to the Shelbyville area? I have a picture from the Shelbyville paper of him and others that had enlisted in Army around 1944. I know he served in the Pacific-Asiatic Theatre (specifically the Burma Campaign) and came home in '45/46. 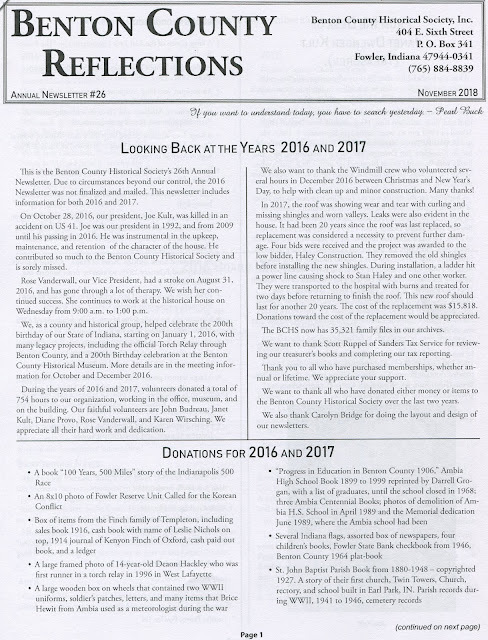 Any info you can find or where to look online about these specific years/events or time frames would be helpful and much appreciated. Thank you for your time. Do you know who would have the original records of the Big Cedar Church? I noticed on the database that you have that some of the parishioners were original members but it doesn't say how long. That leads me to believe that there might be some that had left or died prior to those records. I am looking for evidence of membership of John Brown or David Brown. I don't know who might hold those records. Thanks for your help! 9370 E. Washington Street, Indianapolis. while helping IGS complete our Hendricks County Probate Project. Email Ron Darrah at rdarrah@att.net for details. My G-G-Grandmother was Sophia Kuhl, wife of Henry Kuhl, who settled in La Porte City and ran a grocery business there. It is listed in Holland's La Porte City Directory, 1871-72 on page 215. Sophia had a child, Mary Kuhl, in La Porte in 1856, but is not listed as living with the family in the 1870 census. John A. Smith & Lydia "Liddia” F. Beck (b. 1837 Davie Co NC) were married 15 Feb 1855 in Scott Co. IN. I’ve not been successful in finding John and Lydia Beck Smith on the census, their residence nor death dates. Son John W. Smith (b. 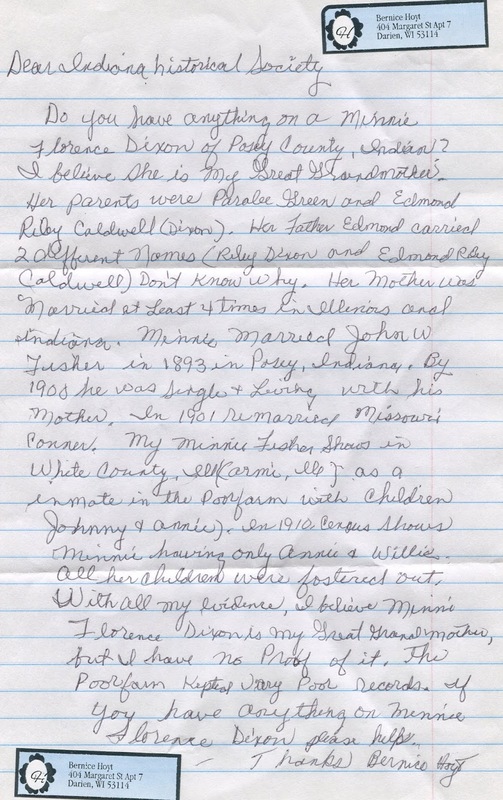 1858) m. Eliza Wilber 8 Sep 1898, Bartholomew Co IN, only father John A. Smith was named. Son Charles O. Smith( b. 1860) m. Mary B. Burns 12 Jun 1891, Jennings Co IN, father John A Smith named. Son Daniel Smith (b.1862 Scott Co) m. (? Female on license) 25 Dec 1900, Jackson Co IN; Residence: New Albany IN; father John A Smith named. Some PC experience required; we will teach probate scanning details. Two to four-hour shifts. Colleagues: A great new resource available! George M. Pullman’s contribution to the annals of transportation in the United States is great. According to the Michigan City Indiana Public Library, Michigan City’s beginnings trace to Pullman-Standard, originally the Haskell & Barker Car Company founded in 1852. 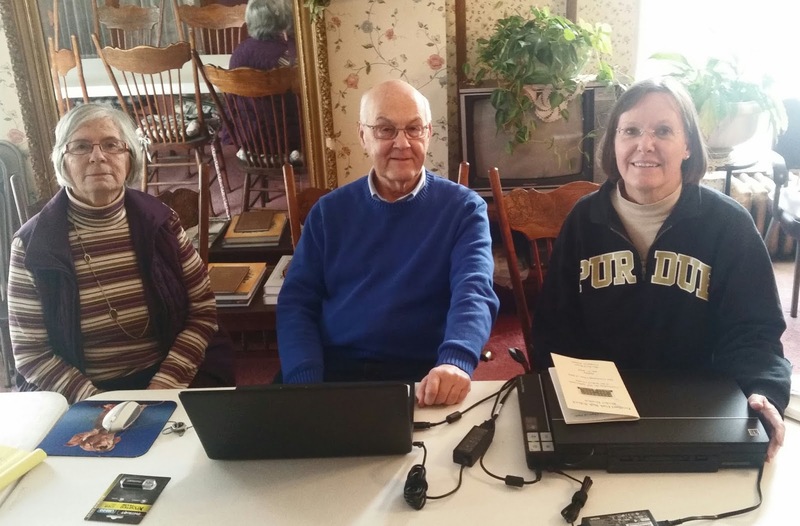 The Indiana University Northwest Calumet Regional Archives in Gary, IN holds a portion of Pullman-Standard records where volunteers have transcribed content from thousands of personnel records into spreadsheets https://scholarworks.iu.edu/dspace/handle/2022/20515. Now, a project to digitize a portion of the Pullman-Standard Railroad Car Manufacturing Company Employee Personnel Records, Michigan City, IN Plant is underway. 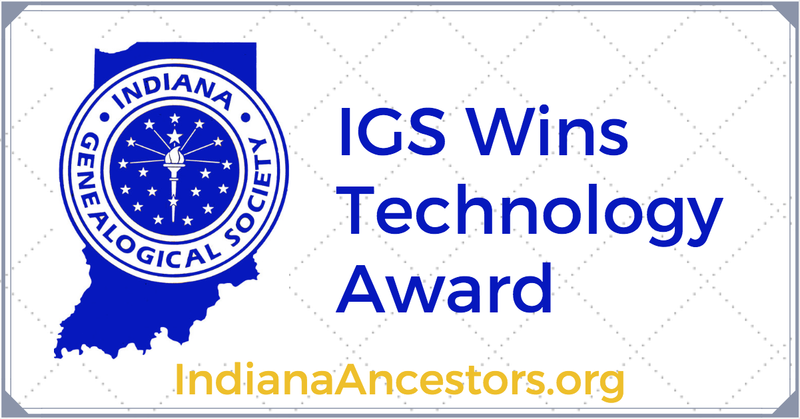 Although the records are not complete for the period 1912 - 1970, those digitized will benefit genealogists, historians, and scholars. 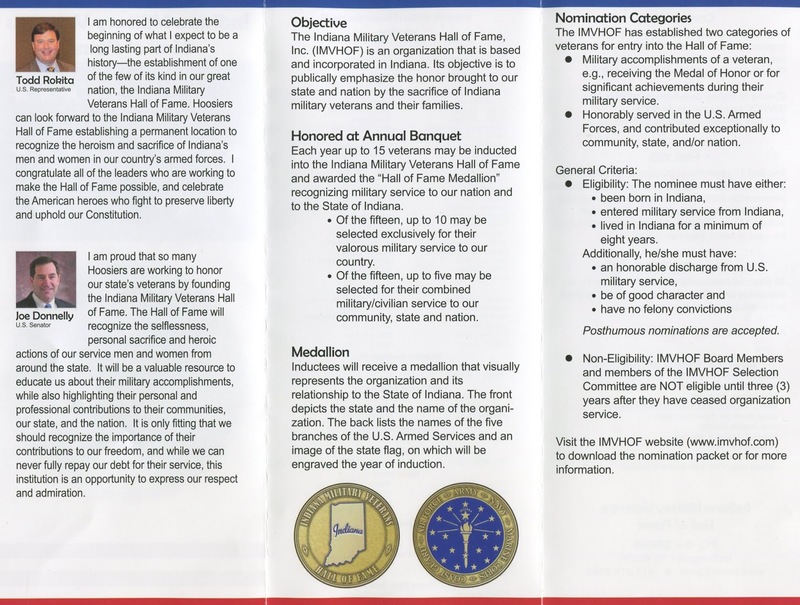 This project is made possible by a grant from the U.S. Institute of Museum and Library Services, administered by the Indiana State Library. The project also acknowledges the support of Indiana Memory where the digitized images will be available. 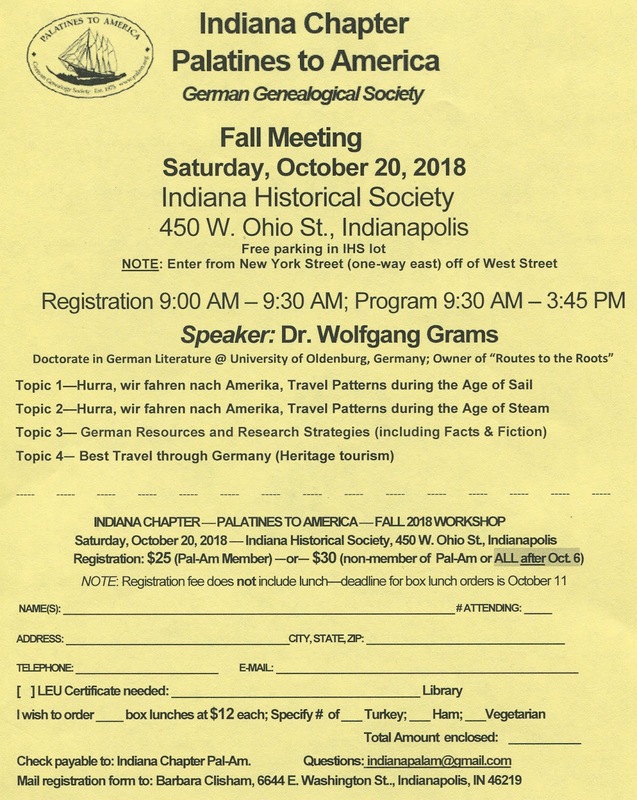 The public is invited to attend the annual “Hoosier History and Heritage Celebration” and meet the newest members of the “First Families of Floyd, Clark, and Harrison Counties Legacy Project” on October 4 at the Floyd County 4-H Fairgrounds Newlin Hall. A drop-in pioneer social will begin at 6 PM with local history and First Families displays and music by Indian Creek Bluegrass Band. The Falls of the Ohio Archaeological Society will exhibit regional artifacts. Surveyor David Ruckman will show equipment used in retracing the Indiana Wilderness Road, a route used by early travelers of the territory. Attendees are welcome to dress as pioneers. Light refreshments will be served. At 7 PM, the Louisville Sons of the American Revolution Memorial Color Guard will open the formal program. New Albany Mayor Jeff Gahan will officially proclaim “First Families of Floyd, Clark, and Harrison Counties in Indiana Day” and “Family History Month” in the city. 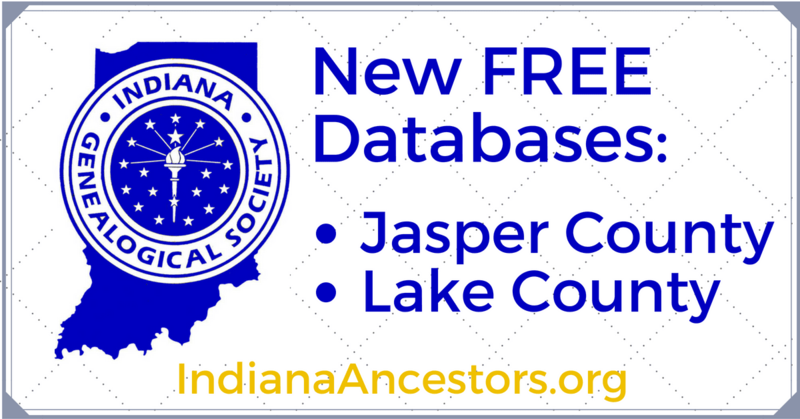 Certificates will be awarded to the year’s honorees who have verified direct ancestors in the tri-county area before 1841. 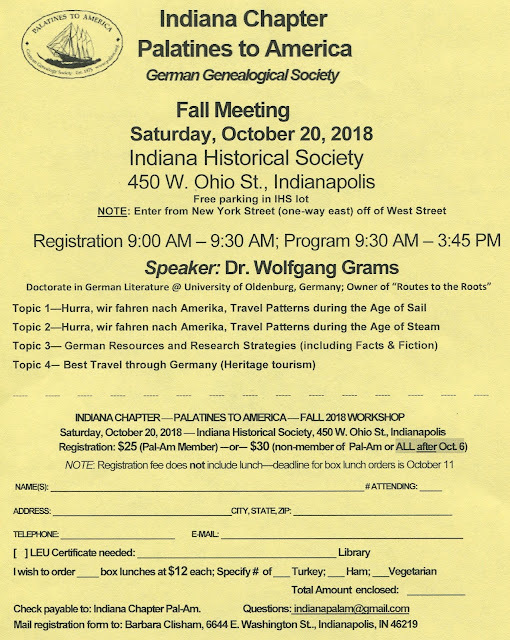 Presenters will be Daniel Bays, Harrison County historian; Jeanne Burke, Clark County historian, and Melissa Wiseheart, Floyd County genealogist. The First Families Legacy Project is cosponsored by the Southern Indiana Genealogical Society and the Floyd County Public Library Indiana Room. For more information about the Celebration or First Families, please visit sigsweb.org or call Donna Kepley Foster at 812-923-3492. I’m looking for information on and/or advice on how to go about researching my ancestry. My maternal great grandmother Lura May married John Lauby, and my grandmother Mary Lauby graduated from Washington Township School, Elkhart County, in 1917. This I know as fact, but I would like to know more and look further back if I can. Any assistance is appreciated. Another "Historical-Genealogical" confusion; she sent it to the right place, though. Berenice Irene Martin, born June 17, 1896 to John David Martin and Rose Ellen Roop Martin, was my maternal grandmother. Her mother died Sept.14, 1901, reportedly in an auto accident. Her father lived to 1910. Via Ancestry.com, I find her with parents, sister Olus, grandmother and aunt living together in 1900 in Union township, Parke County. Next record of her is marriage in 1926, Detroit, Michigan. Her sister Olus born 8/22/93, worked as a house servant in 1910, married in 1914, all in Indiana. There were varied family stories from my mom, Berenice's daughter, as to her childhood. There was talk of an orphanage, so if you have any information you could share I hope to hear back from you. Many of my relatives come from the Vigo County towns of Terre Haute and a place called New Goshen. The surname of these relatives are the Vermillion family. My great-great- great-grandfather was Mason Vermillion and one of his wives was Polly Cannon. Some of his brothers that were supposed to have been in that area were Reason, Cornelius, and William. There may have been more. I just want you to see in your records if the Vermillions in the 1800s lived there. I realize that this request in the future may not be given to me without some fee that I may have to pay; but at least let me know if this family was in fact in that area in the 1800s around 1828 or so. I am researching an ancestor, Samuel Briggs, who died at the Porter County Poor Farm on 6/12/1895 and am looking for records of the residents from the facility. I found a newspaper article that announced the death in the Indianapolis News on the 13th of June 1895 and the Indiana Archives gave me a patient log that listed Samuel Briggs and the date of his death. I was hoping to find more detail about his admission and mention of next of kin. Do you know if those records exist and if so where they would be kept? Thank you for your assistance. The Indiana Genealogical Society recently added 30 free databases that were contributed by recipients of our Indiana Genealogy Digitization Project, a project to give portable scanning kits worth $500 to qualified non-profit groups in Indiana. 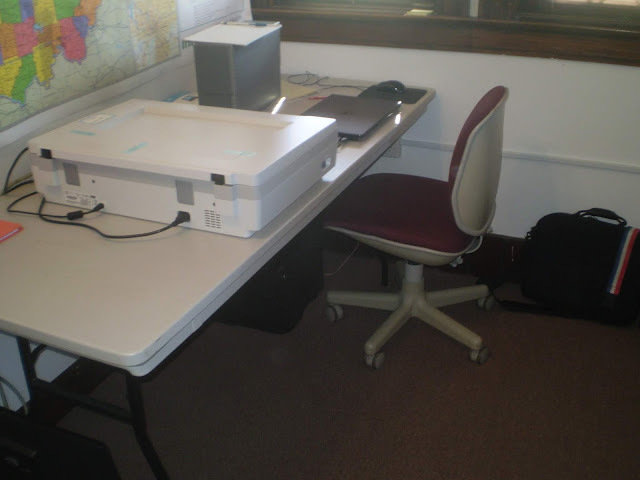 NOTE: The Indiana Genealogy Digitization Project is ongoing. Applications for the scanning kits are still being accepted. Click here for details.